The 4th of July is a great day for parties. 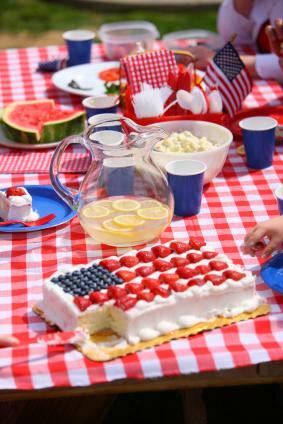 Friends and family gather to celebrate the United States while enjoying picnic-friendly foods. Planning an appropriate menu doesn't have to be difficult, and your guests can enjoy uniquely American dishes, red, white, and blue themed foods, and outdoor favorites that are sure to please. A good menu is cohesive throughout the entire meal, with flavors and textures that complement one another. It's not the 4th of July without some good old American patriotism. 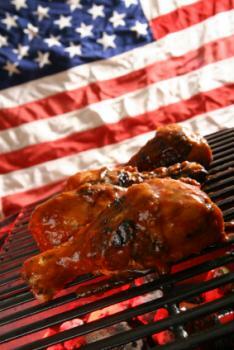 Enjoy this cook-out, sprinkled with red, white, and blue dishes. Grilled hamburgers (main dish): Hamburgers fresh off the grill are the quintessential American cookout food. Serve them with plenty of condiments, including platters of fresh sliced tomatoes, lettuce, and onions. Watermelon, strawberry, and blueberry fruit salad (side dish): Make a delicious fruit salad in red, white, and blue with cubed watermelon, fresh blueberries, sliced strawberries, and a sprinkle of dried coconut. Flag cupcakes (dessert): Frost cupcakes with red, white, and blue icing and arrange them on a rectangular tray in the shape of the American flag. Lemonade (beverages): What's more American than a glass of refreshing homemade lemonade? Serve it as-is, or add berries to give it extra flavor. You don't have to be camping to enjoy a cookout. Build a big bonfire and dine on these fireside classics. Weiner roast (main dish): Toast hot dogs over an open flame and serve with hot dog rolls and your favorite condiments. Veggie tray (side dish): Grab a veggie tray from the deli, or create your own by cutting up nutritious vegetables like red pepper, cauliflower, carrots, and cherry tomatoes. S'mores (dessert): Grab some graham crackers and chocolate, and toast marshmallows. Be sure to have plenty of wet naps on hand to clean sticky fingers. Cooler of beverages: Put a selection of canned and bottled beverages in a cooler of ice, and you won't need to stray far from the fire to quench your thirst. Grilled tuna steaks (main dish): This grilled tuna recipe is an elegant and delicious choice for a formal 4th of July celebration. Grilled eggplant, pineapple, and asparagus (side dishes): This delicious produce takes on a whole new level of flavor on the grill and will suit the tastes of your most discerning guest. Use a vegetable grilling basket or skewers for easy grilling. Vanilla bean cheesecake (dessert): Try this delicious dessert classic for a unique take on the Independence Day holiday. Serve with bright raspberries and blueberries as garnish. Sangria with fresh fruits (beverage): A flavorful summer sangria makes a delicious and anesthetically-pleasing adult beverage for guests to enjoy. With the heat of the July day, you may not want to heat up the house or the grill. Luckily, the summer season makes this a viable option for party hosts! Cold cut/sandwich trays (main dish): Serve platters of meats, cheeses, breads, vegetables and spreads on buffet tables, and invite guests to put together their own delicious sandwiches. Fruit and veggies (side dish): Fresh fruit salad and raw vegetables and dip are a simple, yet tasty, way to satisfy your guests' appetites. Prepare a hearty pasta salad ahead of time, or just serve a crispy Caesar salad. Bakery treats (dessert): If you aren't interested in baking, consider picking up some of many pre-decorated cookies, cakes or chocolate covered strawberries that adorn the shelves for the 4th of July at your local supermarket. Mixer bar (beverages): Create a simple mixer bar with plenty of juices, sodas and liquors, such as rum and vodka. Make up your own 4th of July party food menu by picking out a great main dish and adding a few traditional summer side dishes. Don't forget to add a dessert and a few beverages, and your menu is complete. 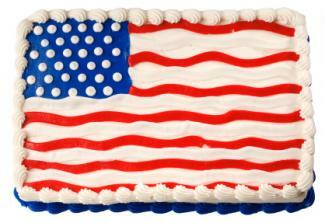 Desserts are among the favorite 4th of July party foods for many guests. Make one or two of these delicious options and you're sure to cater to all your guests' sweet teeth! Patriotic fruit pizza: It's easy to create a fruit pizza using a patriotic color scheme. Start with a roll of sugar cookie dough or prepare your favorite sugar cookie recipe. Press the dough into a pizza pan. Bake it at the temperature and time recommended on the package or in the recipe you are using. While the cookie is cooling, combine eight ounces of cream cheese with four ounces of Marshmallow Fluff. Spread the mixture over the cooled cookie. Top with any combination of sliced strawberries, raspberries and blueberries in a flag or fireworks pattern. Embellish with whipped cream for a sweet flavor. Patriotic trifle: With a store-bought or homemade angel food cake, you can prepare a delicious patriotic trifle quickly and easily. Cut the cake into one inch chunks. Place a layer of cake chunks into a trifle bowl and spoon whipped cream over the top. Add a layer of sliced strawberries mixed with blueberries, and then top with more whipped cream. Repeat the layers until the bowl is full, and refrigerate until it time to serve. Sparkling strawberries: Dip the bottom 2/3 of large strawberries in white chocolate. Let the excess drip off for a moment, and then dip the bottom 1/3 in sparkling blue sprinkles. Refrigerate and serve. Have cold beverages handy for your guests. Guests of all ages will enjoy lemonade, iced tea and soda. Of course, no 4th of July party is complete without offering the adults a beer or a festive cocktail. There are plenty of interesting beverage options if you're trying to stick with a red, white and blue theme. For blue options, mix a batch of frozen Blue Hawaiian cocktails for the non-driving adults in attendance and a pitcher of non-alcoholic Blue Hawaiian punch or blue Kool-Aid for the youngsters and designated drivers. For red choices, whip up strawberry daiquiris with rum or vodka for the adults who want to enjoy spirits, and a virgin version or cherry Kool-Aid for the kids and non-drinking grown-ups. For white drinks, consider serving Sprite, cream soda, or white grape juice for non-alcoholic drinks, with chilled white wine for adults who want a little something extra. 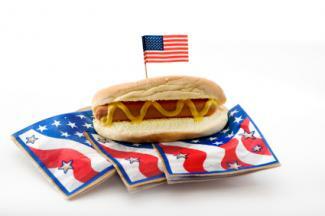 The 4th of July is a great opportunity to have family and friends over for a day of fun in the sun. As long as the food is tasty and plentiful, it really doesn't matter whether your menu is gourmet or simple. The company and activities will set the stage for a festive Independence Day celebration.